The wine glasses are a clue that a party [or perhaps a dinner date] has recently concluded. The cocktail frock confirms that theory—but a bigger mystery nags this 1952 scenario. 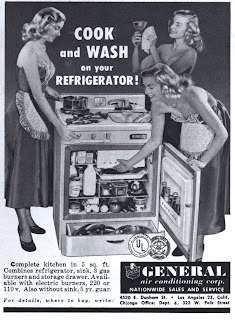 My question: Is this a clumsy attempt at a triple exposure, made to illustrate the three-in-one efficiency of this appliance, or do we see identical triplets, happily keeping house together? 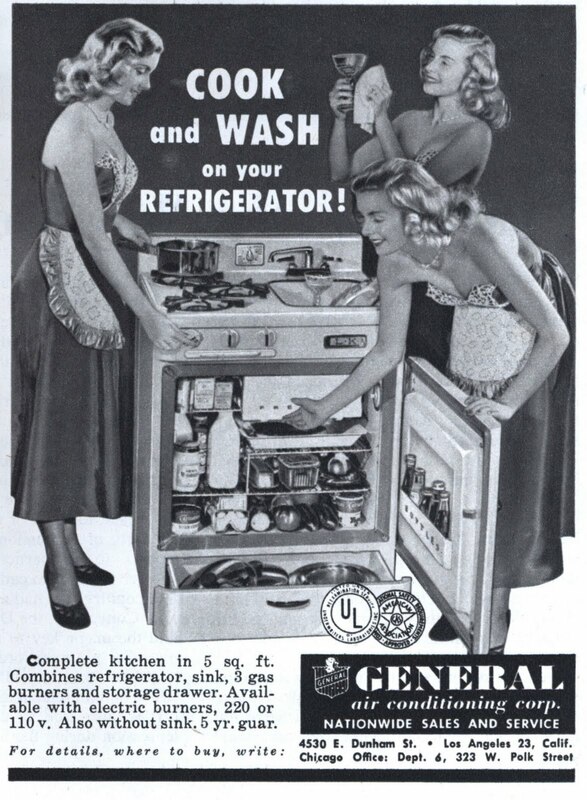 [The Frigidaire space ladies posed a similar conundrum, but for some reason, it didn't bother me so much.] Fans of Flashback Friday, please weigh in with your take on this burning matter. The prominent Underwriters Laboratories mark does put my mind at rest, though, as the close proximity of water and electricity always makes me a bit nervous—even from a distance of almost six decades.